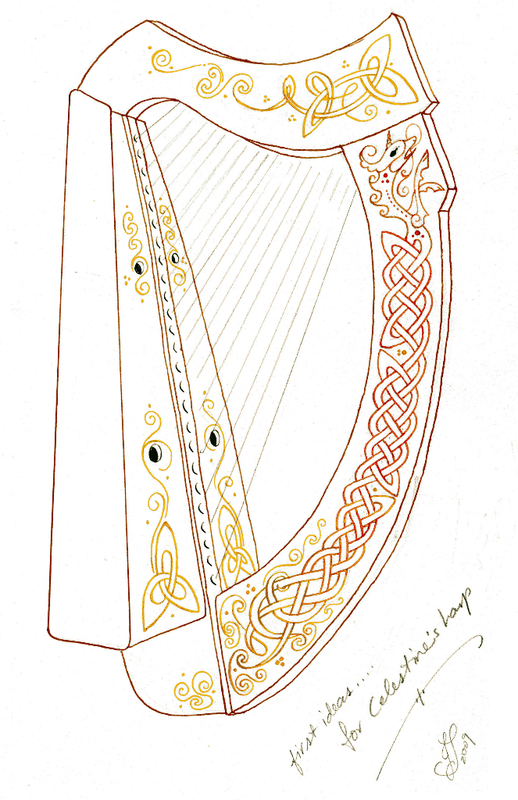 New: Calligrafee on-line Art School ! Who is Jane Sullivan ? The Irish harp is an instrument that easily lends itself to decoration! It is fashioned of noble woods, possesses a wide sound-board, and it evokes myriad Celtic legends that fuel the imagination! 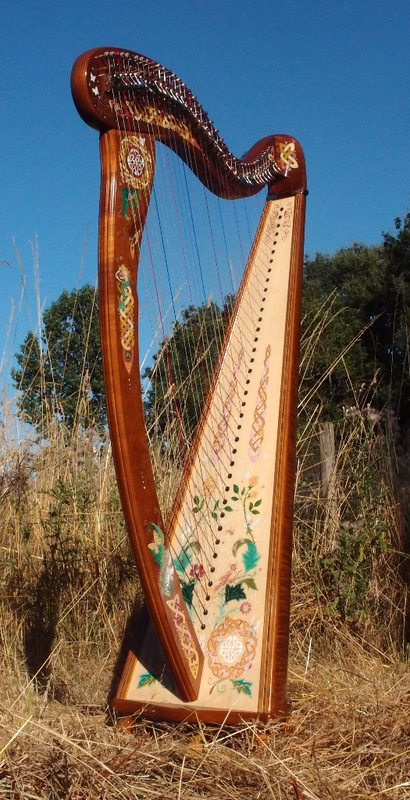 Each harpist, even a beginning student, quickly forges a close and very personal relationship with their instrument — and usually gives it a name as well. It is, therefore, not surprising that Jane is frequently asked to « personalise » a harp with an original harp decoration. Medieval illumination as well as fairy and fantasy art are very popular for this type of commission. 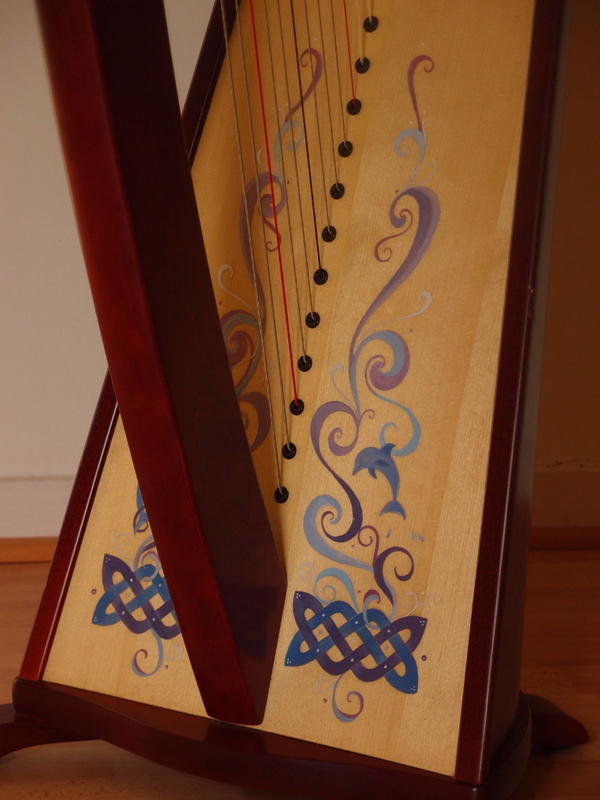 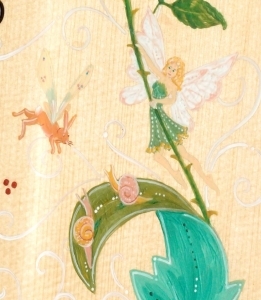 Jane has decorated her own harps, of course, including a concert Mélusine (a lever-harp, 38-string) — an obvious choice for a harpist that resides in the land frequented by the fairy-creature Mélusine! 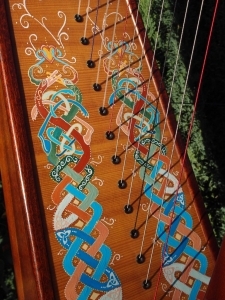 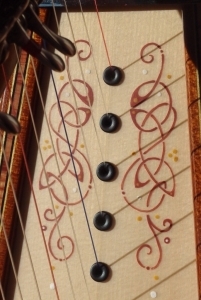 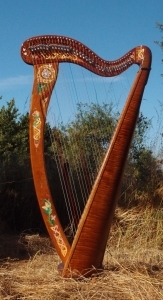 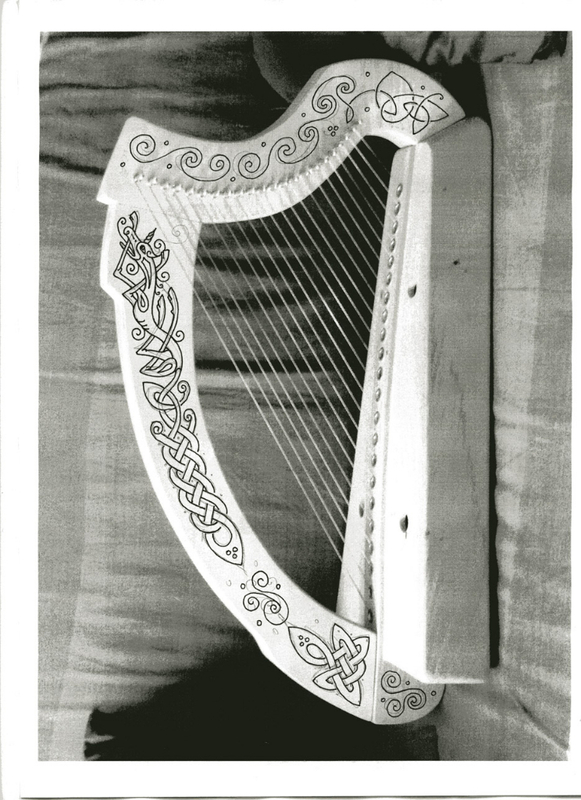 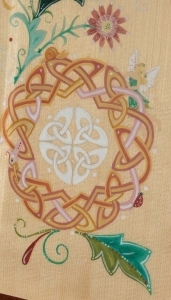 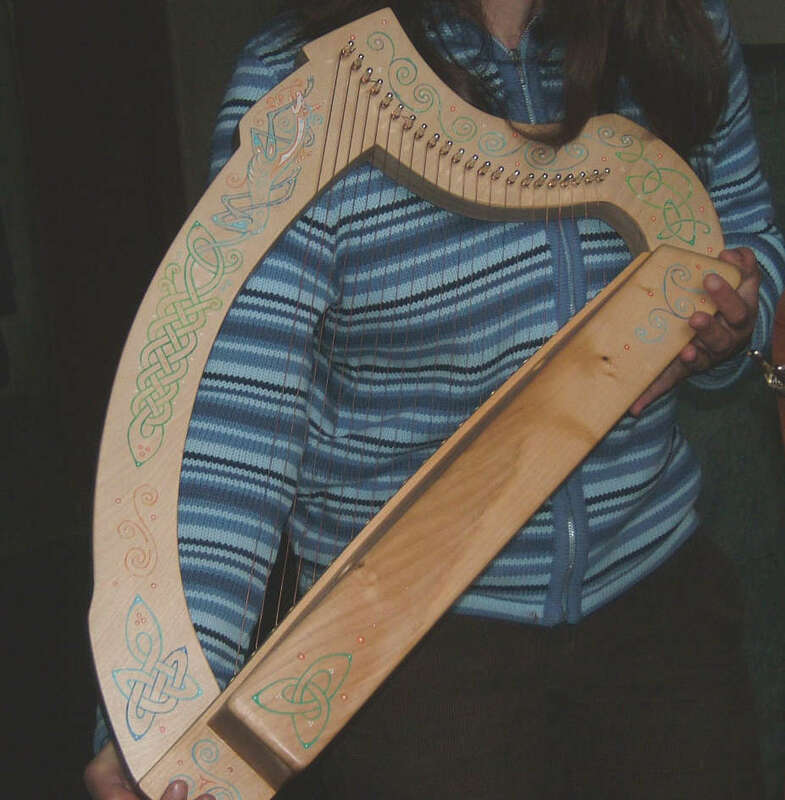 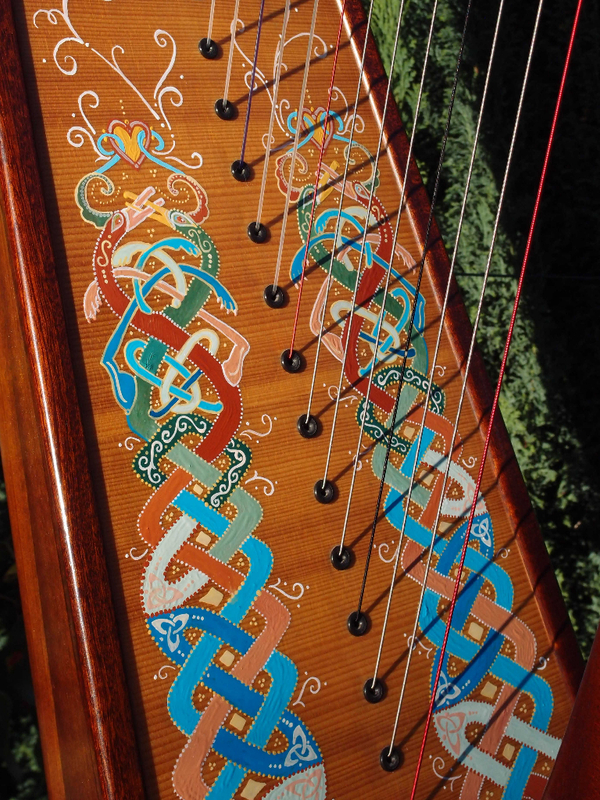 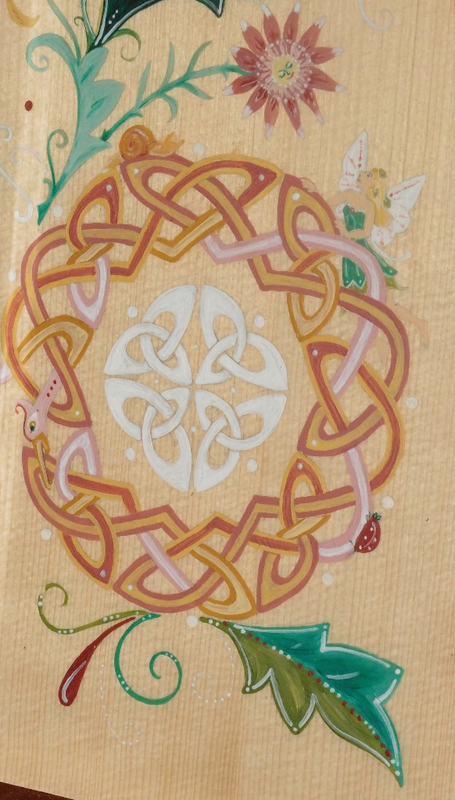 The styles of decoration that Jane suggests for harps can be executed in single or multiple colours, drawing on the inspiration of Celtic or fantasy themes, knotwork and interlace, swirling leaves or vines, flowers or other motifs. 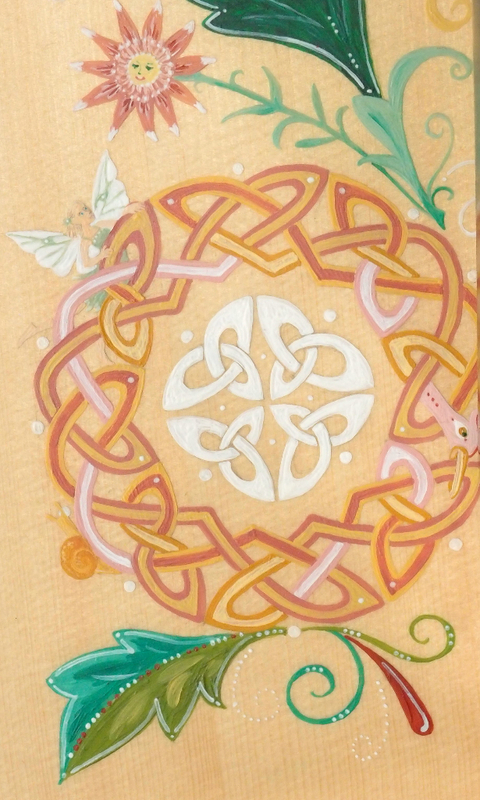 Of course, all of this can be populated by elves, fairies, dragons, unicorns, mermaids or any other marvellous creature desired. The painting is done in oils: this can be painted onto a harp already varnished, but it is obviously better for the artist to work on the elements of the harp before assembly, if possible. If you wish to order a harp to be decorated before it is assembled, please contact Camac Harps, who will deliver the parts of the harp to Jane. 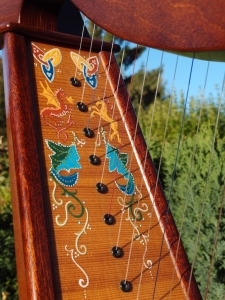 For other harp-makers, please discuss the decoration with the fabricant, and if the parts can be shipped to Jane before construction, this would be best. 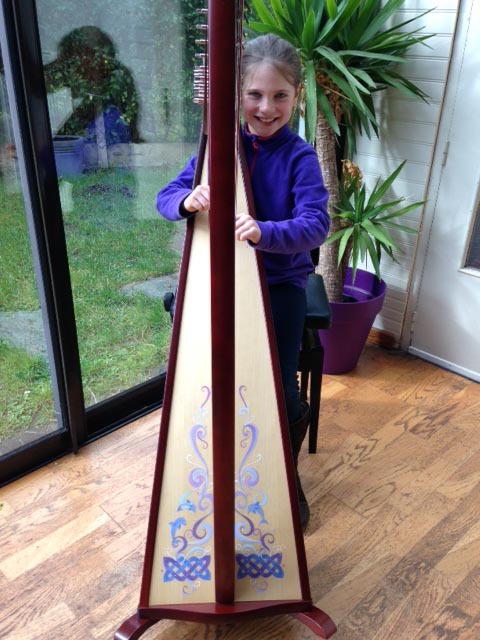 Jane has received in June 2016 her new Mélusine concert-model celtic harp that she decorated herself. 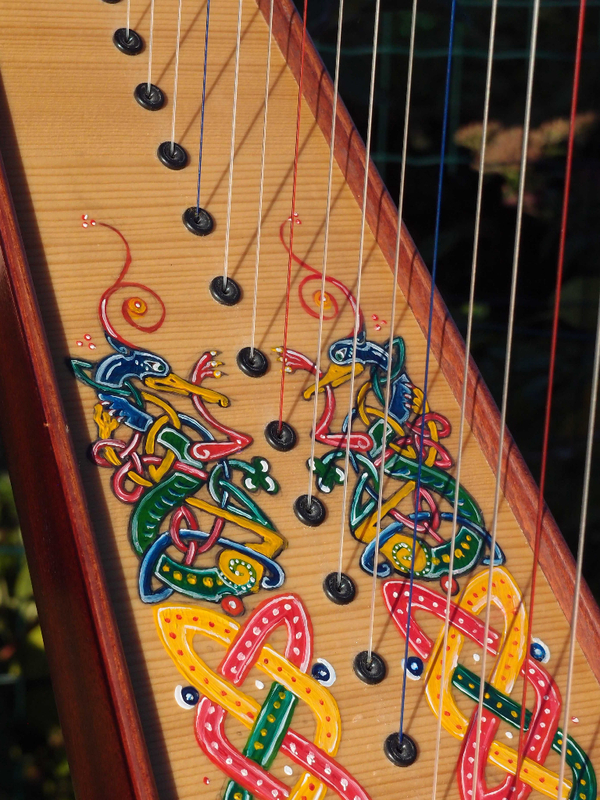 Camac delivered the pieces of the harp separately first, so she could paint them individually. 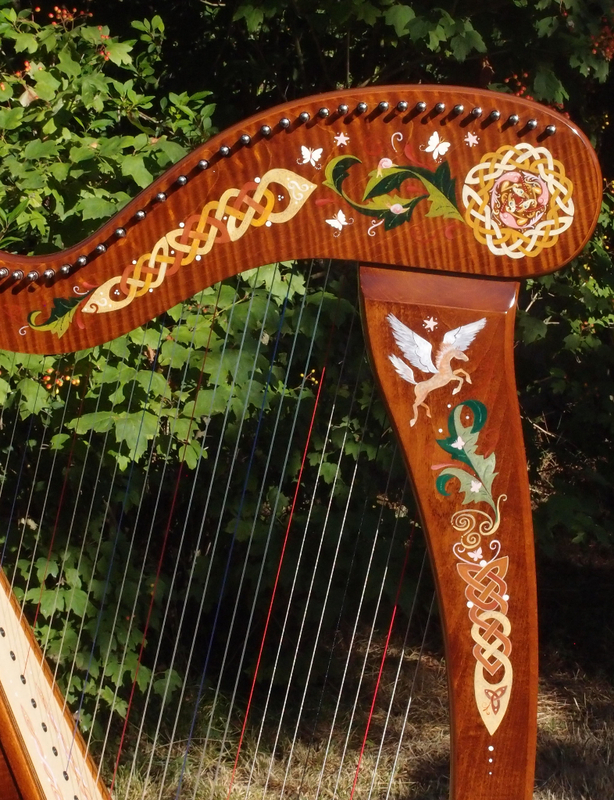 One could say that she « illuminated » the harp, as it is covered with all her favourite motifs from her illuminated letters: a unicorn, a mermaid, a dragon, a flying horse, plus fairies and other fantastical creatures, as well as plenty of celtic interlace! 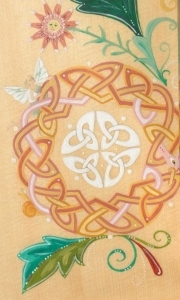 After painting (in oils), the pieces were returned to Camac for assembly, stringing and varnishing. 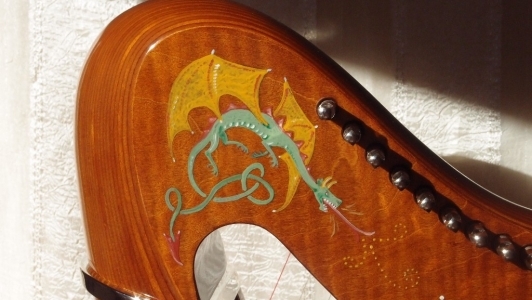 The final result is an instrument full of life and colour, wonder and magic! 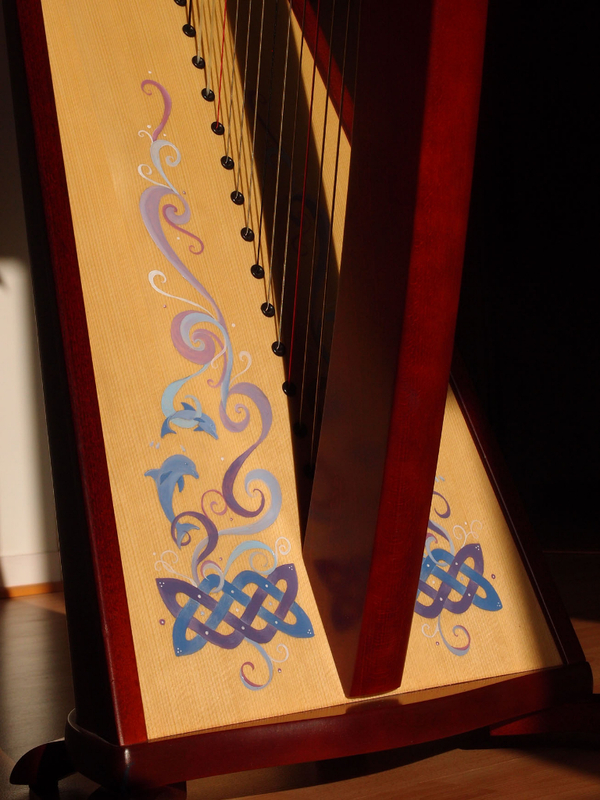 If you would like Jane to paint your harp in similar fashion, please contact her with your ideas so she can show you roughs of a « personalised » concept of illumination for your harp, and give you a quotation and estimate of the time required for the work. 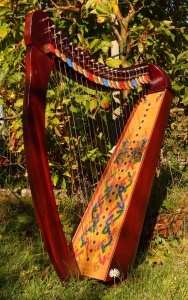 Remember that the harp has to be delivered to her, first, in its separate parts, and assembled afterwards. Moreover, if you yourself are an artist, Jane can also furnish original designs on paper to be transferred onto your harp, which you can then paint yourself. 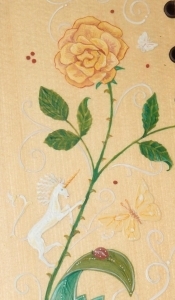 For all supplementary information, please contact Jane. 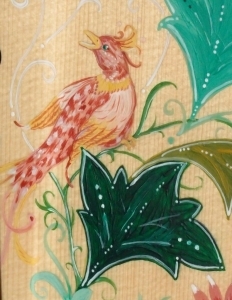 Calligrafee Art School Special Christmas Offer !